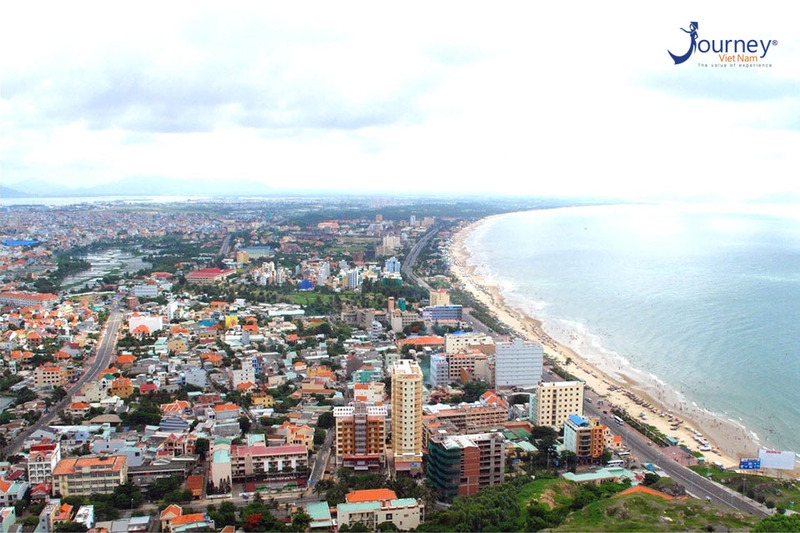 Nha Trang is not only famous as a beautiful coastal city with white sandy beaches ranked in the tourist attractions list, but also has a long list of attractive dishes. Can cake is a popular snack in the coastal city of Nha Trang. The can cake here is made from a kind of liquid rice powder and then grilled on a pan which is designed with small round molds, added with other ingredients such as beef, eggs, shrimp, squid or onion fat to increase the flavor. The cake is served with lemon garlic chili sauce. In many places, local people still add a small piece of charsiu in the bowl of sauce to eat with. And of course, there are also indispensable types of vegetables such as lettuce, herbs and a few slices of sweet and sour green mango. Can cake shop of Mrs. Tu opposite the Pogana Tower. This is a relatively new snack of young people in Nha Trang, so the processing is also very unique. A small cup was placed directly on the charcoal stove, and the owner will put in there a few quail eggs or chicken eggs with a bit of onion, dried onions, sausage, rousong and cheese. The tiny cup contained in it the whole world of snacks with all kinds of fragrant toppings. To enjoy the cup of grilled egg tourists on food walking tour can find it at 22F Cao Ba Quat, this is one of the first addresses to bring this unique grilled egg to Nha Trang. If you do not have the opportunity to enjoy the Da Lat grilled rice paper, the grilled rice paper right in Nha Trang city is also delicious. The price for each rice paper baked here is no more than 20,000 VND / piece. Therefore, visitors on Vietnam food tour can freely enjoy this amazing snack without worrying about your wallet. 19/5 street of Vinh Diem Trung urban area. In the list of places to eat Nha Trang cannot help mentioning the dish: Mussel with rice papers. The rice paper will be baked crispy with a bit of black sesame. Sautéed mussel with onion slices, fragrant and spicy served with crispy rice paper makes diners cannot resist. Each serving of mussel with rice paper in Nha Trang costs about 20,000 VND, please eat while it is still hot to fully enjoy the taste of your dish. Young people from North and South are no stranger to Nha Trang grilled fermented pork meat. Referring to junk food in Nha Trang certainly cannot ignore grilled nem (fermented pork meat). Grilled small pork meat with finger-size, sticky and flexible is grilled on charcoal stove, served with pickles or wrapped in rice papers with vegetables. Fatty, sweet and spicy sauces will make diners on Vietnam food tours fall in love with it whenever they remember. Baked egg cups, rice paper, mussels and rice paper are all dishes that make young people “crazy”. Please check-in the address of snacks in Nha Trang above when having the opportunity to visit this beautiful coastal city!